I visited the Forbidden City a year ago, but got caught up in a rain storm and barely made it through the first few gates. So today we decided to give it another go. (I’m in China now, by the way). 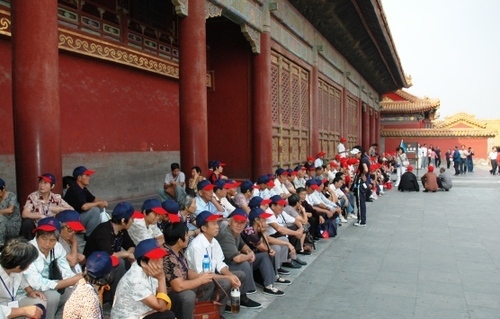 It seems no matter what time of year or day you visit, the Forbidden City is always packed with tourists. A few of them are westerns like me, but most of them are bussed in from the rural areas of China. They excitedly wait near their flag-toting guide, wearing matching hats, taking in all the history and sights. Today, I was one of those sights. The joke’s on them when they realize how unphotogenic I am. It’s creepy to think they’re carrying around a photo of me on their camera, even worse that it’s likely a bad photo. If anyone approached me on the street anywhere else and asked to be photographed with me, it would be really weird. But in the Forbidden City, it’s commonplace. It happened to most of my white friends that have visited and I came to almost expect it. Stephen thinks it’ll be another 10 years before white people stop being such a spectacle there. Today was actually a nice day (for Beijing standards–the sun was peaking through the polluted sky) so we managed to walk the entire length of the city. The last time Stephen had done it he was young, so he overestimated how long it would take. We got through in less than an hour. We only stopped occasionally to read signs or take photos. Stephen approached a group of teens and asked one of them in Chinese if they could take our photo. The guy gave him the same face I give the waiters that speak to me in Chinese. “Uh.. I don’t speak…” he muttered. Stephen then asked him in English and everyone shared a laugh. The guy was Korean and a great photographer–he pranced around the area trying to get the best shot while his friends laughed at him. It must be hard to be Asian but not Chinese in China. I can imagine myself giving the blank “Uh… I don’t speak…” face if I ever travel outside the UK in Europe. I’m looking forward to it.